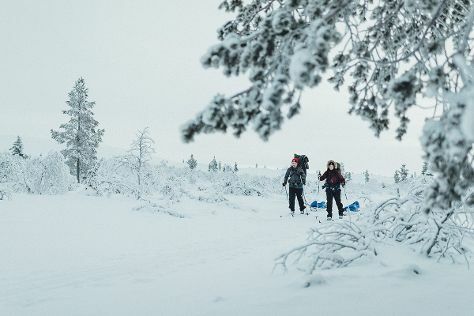 On the 25th (Mon), look for all kinds of wild species at Wildlife Areas, then explore the wealth of natural beauty at Urho Kekkonen National Park, and then look for gifts at Hippupuoti Gift Shop. Keep things going the next day: fly down the slopes at Saariselka Ski & Sport Resort. To find other places to visit, reviews, ratings, and other tourist information, read our Saariselka journey planner. Riga, Latvia to Saariselka is an approximately 13-hour flight. You can also drive. Plan for little chillier temperatures traveling from Riga in February, with highs in Saariselka at -6°C and lows at -15°C. Wrap up your sightseeing on the 26th (Tue) early enough to travel to Levi. Start off your visit on the 27th (Wed): kick your exploration up a notch at Levi Ski Resort. Get ready for a full day of sightseeing on the 28th (Thu): identify plant and animal life at Santa"s Cottage & Pet Farm, then admire all the interesting features of Ice Karting Levi, then take an exotic tour of a safari tour, and finally get your game on at Kid's Land. To see where to stay, more things to do, other places to visit, and more tourist information, read Levi vacation maker site . Traveling by flight from Saariselka to Levi takes 3 hours. Alternatively, you can drive; or take a bus. In February, daily temperatures in Levi can reach -5°C, while at night they dip to -12°C. Wrap up your sightseeing on the 28th (Thu) to allow time to drive to Rovaniemi. Start off your visit on the 1st (Fri): find something for the whole family at Santa Claus Village, see Santa Claus Office, then look for all kinds of wild species at Wildlife Areas, and finally don't miss a visit to Lordi's Square. Here are some ideas for day two: look for gifts at Your Piece Of Finland, take an in-depth tour of Arktikum, and then get in on the family fun at SantaPark - the Home Cavern of Santa Claus. To find reviews, where to stay, and tourist information, you can read our Rovaniemi trip maker website . Getting from Levi to Rovaniemi by car takes about 2.5 hours. Other options: take a bus. In February, daily temperatures in Rovaniemi can reach -6°C, while at night they dip to -11°C. Cap off your sightseeing on the 2nd (Sat) early enough to travel back home.